It may be necessary to filter your data to remove periods of anomalous background levels, such as the flares seen in ACIS observations. 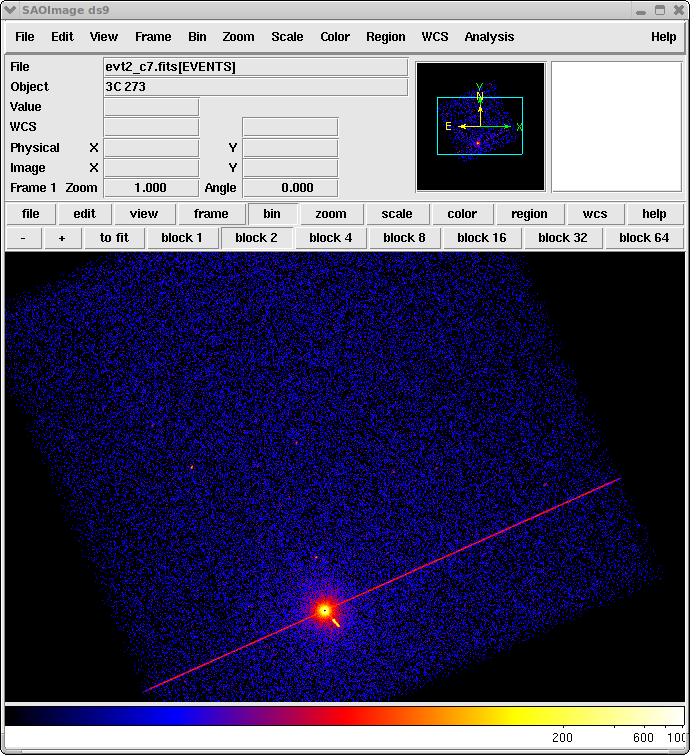 The CIAO package includes the dmextract tool to calculate the lightcurve of a dataset (or region within a dataset), and the dmgti tool to create a GTI file given a table and a set of limits. 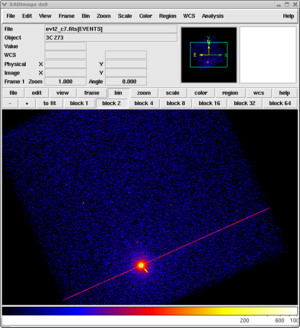 To analyze the light curve of the ACIS imaging background in order to clean the dataset of periods of anomalous background rates. The algorithm used to detect flares is simple, so it may not be sufficient in all cases. If you intend to use the ACIS blank-sky background files, the cleaning described in this thread is not conservative enough. Instead, use the alternative method described in the Removing ACIS Background Flares thread. Removing ACIS Background Flares thread: an alternative method of flare detection. Last Update: 05 Jan 2017 - Review for CIAO 4.9. Added info about obsid 3103 which is used part way through the thread. This thread uses the lc_sigma_clip routine from the lightcurves.py module. The deflare script may also be used to run lc_sigma_clip. An image of the data is shown in Figure 1. ACIS-S3 observation in the 0.5 to 7 keV energy range. To avoid any background variations due to sources in the field we first filter out regions of high/variable emission from the dataset. There are a number of ways to create a list of regions that should be excluded - for instance you may wish to use the output from one of the source detection programs. In this thread we shall use visual estimation, as an example. The chosen regions are shown in Figure 2 (note that we ignored several obvious point sources in this example). For this example, the regions were chosen to contain most of the source emission. unix% pset dmextract "evt2_c7.fits[exclude sky=region(exclude.reg)][bin time=::200]"
The contents of the parameter file may be checked with plist dmextract. The lc_sigma_clip() routine provided by the lightcurves.py script performs an iterative sigma-clipping algorithm, removing those points that fall outside +/-3 sigma from the mean at each iteration until all data points are within +/-3 sigma (the number of sigma used to clip the data defaults to 3 but can be changed). This algorithm is robust but not perfect; it can easily "overclean" a noisy lightcurve and should not be used blindly. The routine can print out the limits used and can also create a GTI file that encodes these limits. The deflare script provides a command-line interface to lc_sigma_clip. There is an example of using deflare in the running lc_sigma_clip via the deflare script section; see the ahelp file for more information. The top plot shows the light curve of lc_c7.fits, where the time axis is displayed on the x axis as a relative value (the first bin in the light curve is used as the 0 point). Points that are in green are those that passed the sigma-clipping and the horizontal dotted line shows the mean value of these points (the numerical value is given in the plot title). The bottom plot shows a histogram of the count rate values; the green version again shows the data that passes the sigma-clipping algorithm. Note that this count-rate filter has been unable to remove all the flare periods. You can try lowering the maximum rate - e.g. to 0.7 - but you may find that for such strongly-flaring data that it is hard to select a "clean" set of times. To create a plot of the filter, set plot=yes when running deflare. For this part of the thread we switch to OBS_ID 3103. The setup to create the light curve file is similar to as before. By default, deflare filters out the times where the background count rate exceeds the ±3σ about the mean. These regions are indicated in red on the lightcurve that is displayed in Figure 5 for a lightcurve of ObsID 3103. Light curve cleaned using the lc_sigma_clip routine. Lightcurve filtered using lc_sigma_clip with the default values, including clipping any points outside ±3σ about the mean. A larger number of time intervals have been rejected with the 1.6σ clipping, as shown in Figure 6. The lightcurve is filtered by clipping any count rates outside of ±1.6σ from the mean. This is done by setting the deflare parameter nsigma=1.6, which is equivalent to setting the lc_sigma_clip parameter, sigma=1.6. The output time periods can be used to filter the event list. The lc_sigma_clip routine can create a GTI file directly, or you can use the limits it calculates to create the file yourself using the dmgti tool, or use them directly within a DM filter expression, as described below. The regions filtered out are indicated by a solid red pattern as shown in Figure 7. The top plot now indicates the regions excluded by the GTI file created by lc_sigma_clip - here lc_c7.gti - using a solid red pattern. See	"ahelp lc_sigma_clip" for a full list of options. userlimit="((time >= 77379470.949928) && (time < 77399470.949928))||((time >= 77404870.949928) && (time < 77406670.949928))"
The contents of the parameter file may be checked with plist dmgti. (clobber = no)              OK to overwrite existing output file(s)? (smooth = yes)             Smooth the input MTL data? (clobber = no)              Clobber output file if it exists? 08 Dec 2005 updated for CIAO 3.3: default value of dmextract error and bkgerror parameters is "gaussian"
15 Dec 2008 updated for CIAO 4.1: analyze_ltcrv.sl has been replaced by lightcurves.sl and the routine analyze_ltcrv() by lc_sigma_clip(); added a Python version of the script; plotting capabilities have been restored; the routine can now generate a GTI file directly. 02 Dec 2013 Review for CIAO 4.6; no changes. 17 Dec 2014 Review for CIAO 4.7; no changes. 05 Jan 2017 Review for CIAO 4.9. Added info about obsid 3103 which is used part way through the thread.